The second annual Drive-in, Grill-Out Movie Theater at the Missoula Fairgrounds, brought to you by Axmen! This event sold out last year and is sure to be an even bigger event this year. 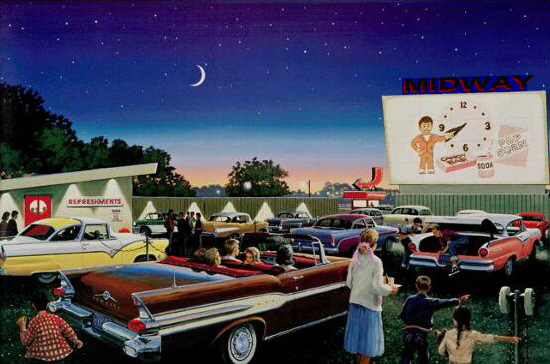 Bring back the nostalgia of the drive-in movie and enjoy a classic movie, exactly the way it was meant to be seen, from the luxury of your own car! Pack your family in the vehicle or bring a friend. You are welcome to bring a grill to tailgate before and during the movie or you can can get some awesome pulled pork sandwiches, soda, popcorn and candy from the Missoula Cullinary College kids. Tickets purchased in advance will be assigned the best spots, so get your tickets today! PLEASE NOTE: No outside alcoholic beverages will be allowed. There will be alcoholic beverages available for purchase, provided by The Rhino. Just like the old days, cram as many as you can into the station wagon and enjoy the movie! VIP HOT TUBS: $300 each – Hot tubs can fit 4-5 (or more if you’re all friendly) people, so bring some friends, towels, beach balls and whatever else you please and enjoy the show! Contact amanda@axmen.com or click below to reserve your VIP spot today!